In a pan, boil the water. Meanwhile just add few drops of water to the ragi powder and make it to a paste so that it doesn't form any lumps when added to the boiling water. cook in a medium flame for 10 minutes. Make sure ragi is cooked properly and then add powdered jaggery and mix well. Transfer it to a bowl, add milk and broken nuts, raisins and serve hot. refrigerate it and serve as a cold beverage too! it tastes awesome both ways. I am one of the few people who actually likes Raagi. My mom makes a kind of dish with buttermilk and raagi, wonder what it is called though. Interesting...ragi pudding...well these days am trying to include raagi in my list too..
Oh my gosh, it is so good to have you back! Nice blog for those who loves to eat raagi. Lovely! 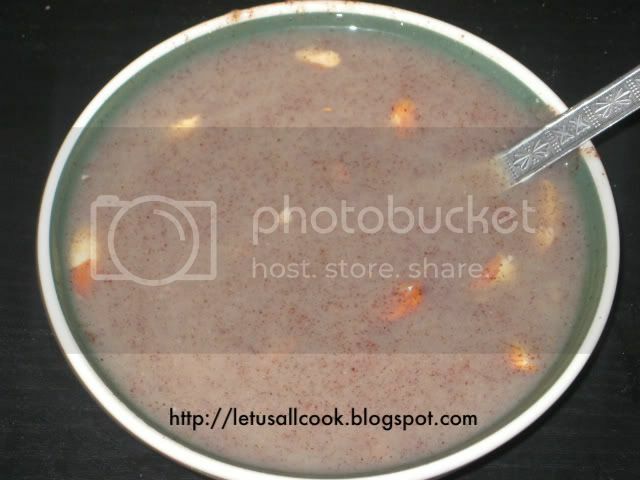 !Ragi pudding looks very temtping and yummy & a healthy bowl!! This is my mom's fav,but she uses sugar in place of jaggery. I have to taste it after the recommendation :) haven't eaten ragi before. Aal sathame kaanum... appa appo comment mattum varudhu... I will call you soon. Got an appt tomorrow. Sethu vechi koopadren. I have seen ragi in the shops and have never known what to do with it. This seems like a good recipe to begin with as it is sweet and milky and I am sure to like that! Will try next time I can get to shops to buy ragi. My mom has ragi and I love the way you have changed a basic grain into something of a dessert. Please visit my blog and collect an award. Just wanted to come by and say hi because I was wondering if you're doing ok! Hope you're having a nice summer! Healthy dish. There is something waiting for you in my blog. Plz collect it dear. I actually have never heard of this before. Looks like i will be trying this out. Soon I will submit some of my recipes from my site to be on yours. I too make raagi payasam to ease my sugar rush, its guilt free afterall. Nice one, dude. This is gr8. But I have a doubt. Generally Ragi is very good for health. But I have also heard that it is heat. During pregnancy we don't eat things that increases heat in our body like papaya?...how to consider ragi in this case?..Is it advisable to take raggi during pregnancy. pls. give ur opinion. Good and simple one. I love Raagi too. My mom used to make Raagi Ada. She does by making dough out of Raagi adding curry leaves and onions. If you have any other variation of it, do share that too. Lovely! I must try this. You have a beautiful blog! Gorgeous post, It’s surely going to be loved by all blogging and internet enthusiasts. I know one more fantastic site where they have an equally great theme. Thanks for good recipes. Really it's very nice recipes. Good recipe,I want to know more. I really like the way you narrated the complete cooking process.Ragi is very good for health.I was searching for some blogs based on cooking Ragi dishes..All the ingredients are easy to obtain.Great work.Post some more Ragi dishes. Thanks for this! Tried making it from a different recipe but couldn't get the food texture quite right. Yours turned out perfectly! There is so much to discover even in Indian cooking is revelatory. I made this ragi pudding for my kids and they loved it a lot.Thanks for sharing. Nice post ragrding healthy food recipes Thanks for this post look forward for more post. A Fantastic range of modern and classic Cookware available at sensible prices to help create that perfect dining experience. nice pudding i love this foods a lot. you are really so good man because i like this foods and i want to eat it. i am trying to make this. This is very Nice blog,Thanks for sharing this. interesting pudding recipe. I may try to fix it. Thanks for sharing the post.Bus Ticket Booking Get the Best Online Bus Tickets Reservation Services with Ticketgoose. Your Online Bus Tickets Booking is just a click away!